The Edithburgh to Sultana Point Walking Trail is part of the “Walk the Yorke Trail”. 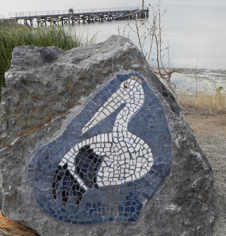 Trudie Howith, a local artist, had a vision to mosaic the rocks along the foreshore to add interest to the natural beauty of the walk. The District Council of Yorke Peninsula welcomed the idea and Trudie set about seeking local sponsorship and encouraged the local community to take part in the shared art project. The nautical themed mosaics provided an opportunity for the community, no matter what skill levels they had, to take part in this wonderful project. All materials and labour for this project were donated by the Council, local businesses and community groups. A special thanks to Trudie who had the vision and managed the project to successful completion. SPONSORS: District Council of Yorke Peninsula, Edithburgh Progress Association, Hansons and Curramulka Quarry who supplied the rocks, Tapes, Yorke Tiles, Terry Braund.